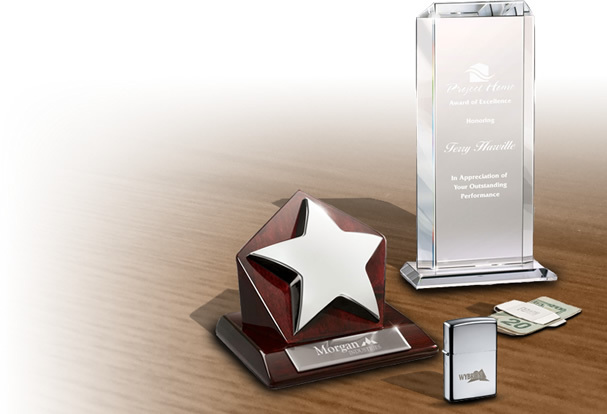 Custom matchbooks and promotional lighters from The Executive Advertising can be imprinted with your company logo for no additional charge! 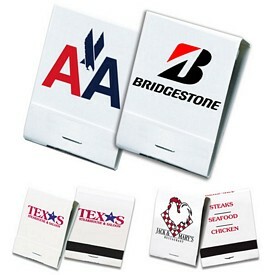 Our branded advertising matchbooks come with 10, 20, or 30 strike matches. 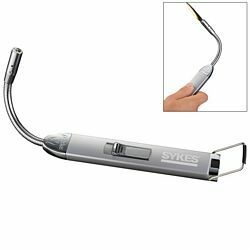 Looking for a low priced promotional lighter? 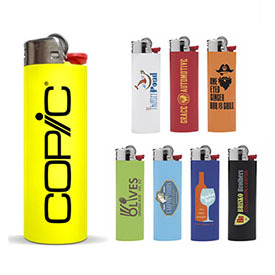 Our Bic mini and multi-purpose lighters have a large imprint area so you can easily get your personalized company logo in front of your current and prospective clients! 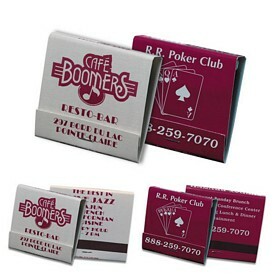 Customized matchbooks can be effectively customized to become great marketing tools. 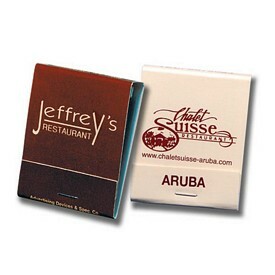 We can convert simple matchboxes into promotional matchbooks by affixing your company logo. 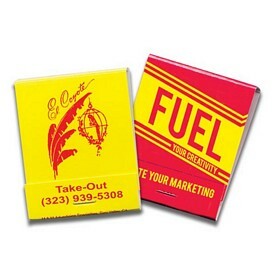 The customized matchboxes can give widespread recognition for your brand. 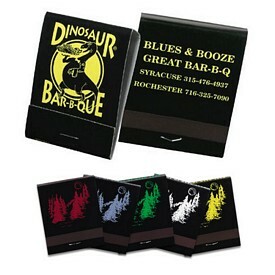 Choose between metallic colors, multi-color imprints, books, and boxes to get the exact custom matchbooks that you need for your promotional campaign. 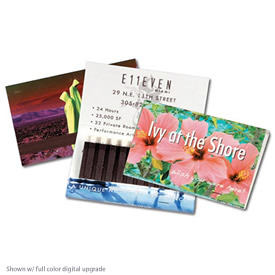 Order your custom matches today! 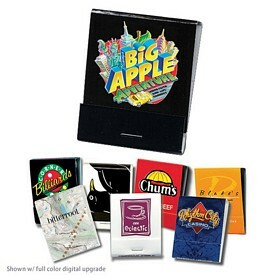 Promotional 30 strike assorted colors match books with a free color logo imprint and free artwork-proof is a must buy. 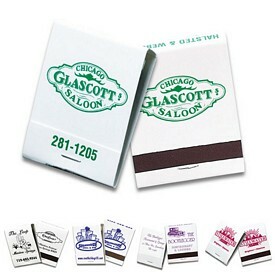 The inside printing is upgradable to the matchbook cover color. There is an even assortment of colors like green, red, light blue, white, and yellow. All the custom matchbooks come with a black imprint. 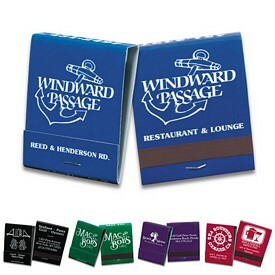 Whether you want to endorse a hotel, restaurant, or a bar, the branded matchbooks will look great. 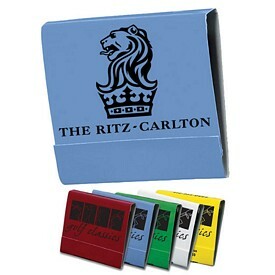 The logoed 20 strike Assorted Black Matchbooks look exceptionally classy. 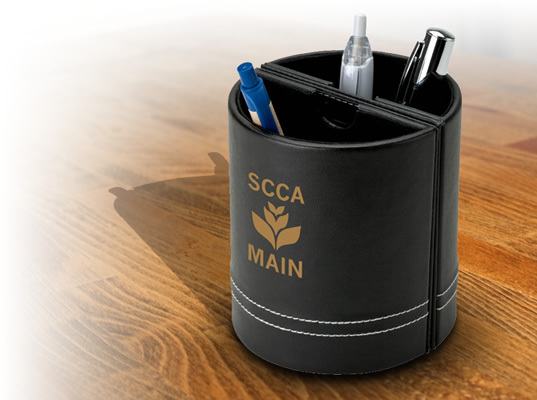 You can upgrade to inside printing in black ink color. Colors available are white, yellow, light blue, red, and green color cardstock. Printing will be done in a single color. 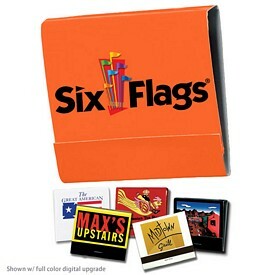 The size of the item is approximately 1.5"W x 2"H. Promotional Match books have 8-10 matches in each case. 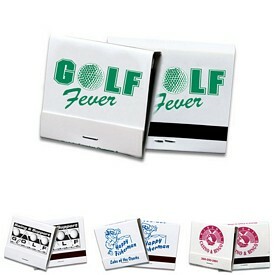 We will print the artwork on all the four sides on the box of branded matchbook. The colors start from white cardstock. 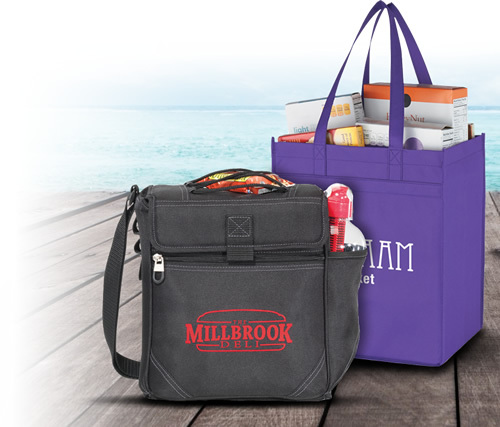 Multi-color printing up to four colors can be done. 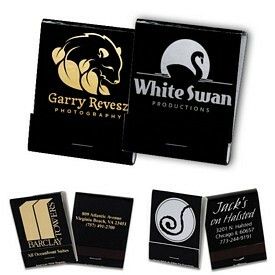 If you are looking for something exclusive, then the premium card-stock 20 strike metallic foil matchbooks can meet your requirements. 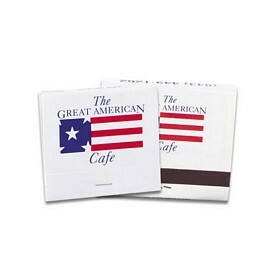 Standard black printing as well as reverse printing is available. 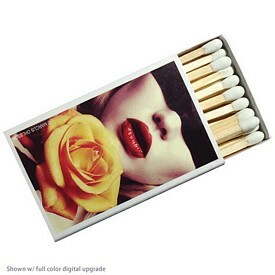 The match heads are white. 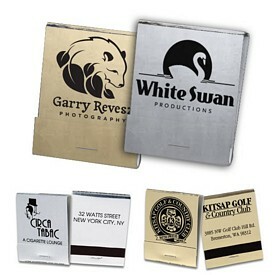 The shiny promotional silver and golden matchbooks with have a white inside cover. 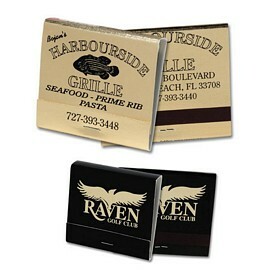 The custom match books make a superior style statement with the black imprint. The 20 strike promotional match books are colored in reverse. 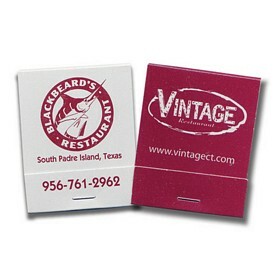 They have been priced economically and have one color imprint. 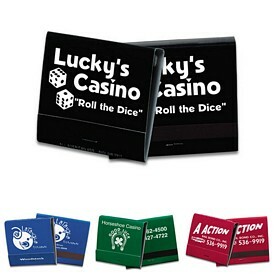 Available colors start from a white cardstock with a reverse printing in black, blue, red, green, or purple. There are no assortments. 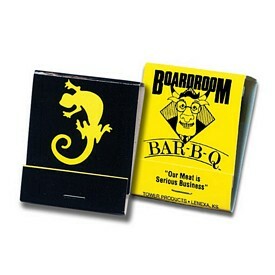 The 30 strike custom print matchbooks consist of a one color artwork print on a white board. 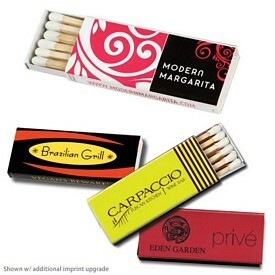 You can completely customize the matchbook according to your preference so that your business reaps the maximum benefit due to the promotion of the custom matchbox. 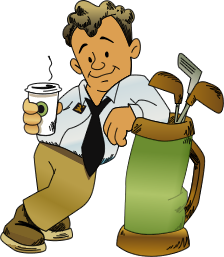 You will need to request a quote if you are ordering more than three colors. In all, 6 colors can be ordered. 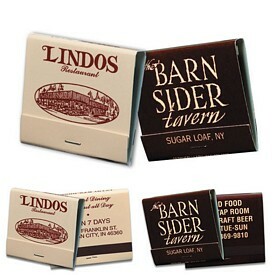 Inside of the matchbooks can be printed for a small upcharge. Match heads will be white. 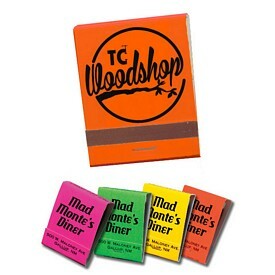 You can upgrade the matchbooks to have a UV gloss coat. 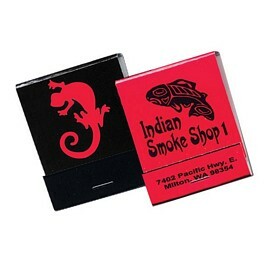 The promo 20 strike neon matchbooks look striking. 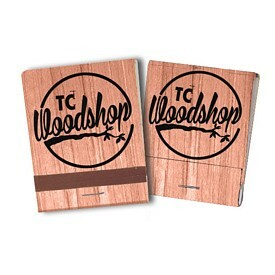 The inside of the cover can be printed with black ink. 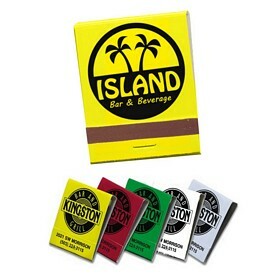 You can get the custom printed matchbooks in neon yellow, green, pink and range. The promotional BIC lighter comes with a patented BIC child guard system. Customers will get 3000 lights per lighter. You can get up to eight imprint colors on two sides. 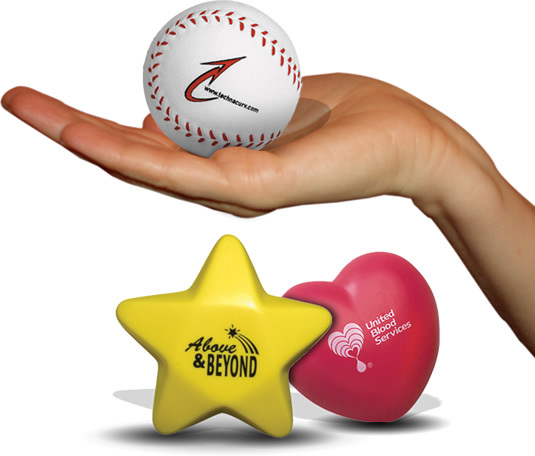 The promotional lighters make exceptional household goods and can be obtained in colors like white, black, orange, green, blue, navy, forest green, and red. 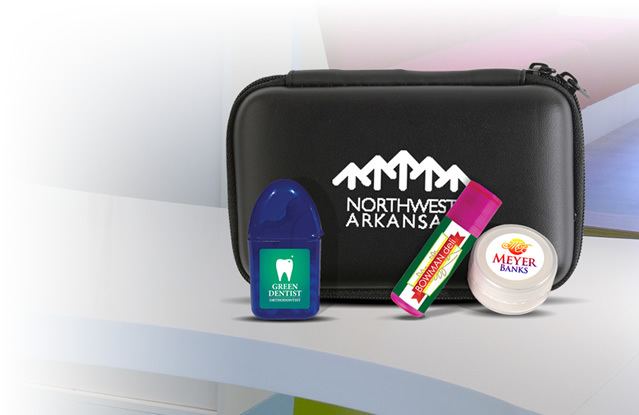 Your custom imprint can be placed vertically or horizontally. 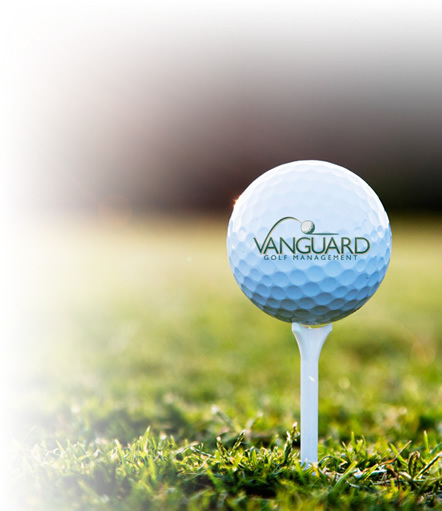 One color logo imprint will be done free of cost with no additional setup fees.